A car diagnostic test in Azusa from Johnny’s Auto Service can help you get to the bottom of that flashing light on your dash. 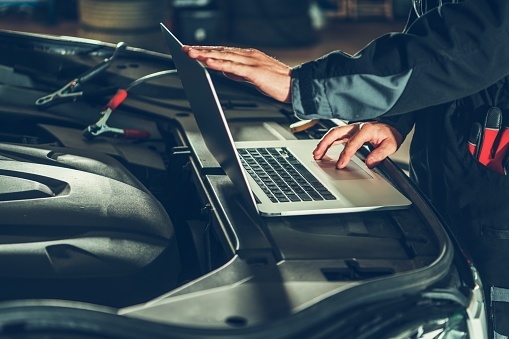 Whether the check engine light has come on or an electrical component is suddenly on the fritz, our diagnosticians can get to the bottom of the issue and help you repair it right away. If you’ve been searching google for “car diagnostics test near me” then that probably means you’ve been having a problem with your vehicle. There’s no need to puzzle over a car diagnostic problem any longer–visit Johnny’s today. At Johnny’s we’re committed to maintaining a clean, pleasant shop. Whether you spend your time in our comfortable waiting room, sipping free coffee and using our complimentary Wi-Fi, or if you need to get a sneak peek at the service we’re doing, our bays are always spotless. And we’re convenient, too, with after-hours drop-off available. We’re even happy to offer same-day repairs on many of our services, including routine oil changes, computerized wheel alignments, and more. When you’re searching for a “car diagnostics test near me” in Covina and the surrounding areas, be sure to visit a shop that makes you want to return to it again and again. Our shop is clean, our staff is pleasant, and we offer our customers high-quality workmanship on every job. Communication is easy at our shop. Give us a call at (626) 966-5212, or visit our website to fill out an appointment request form. Our technicians have experience on all brands, from your foreign hybrid to your classic domestic car. We’re an ASE-certified shop, carrying the Blue Seal of excellence. That’s how you’ll know that your car is in the best hands. We offer so much more than a car diagnostic test in Azusa. Visit us today to learn how we can become a trusted partner in the maintenance and repair of your vehicle.